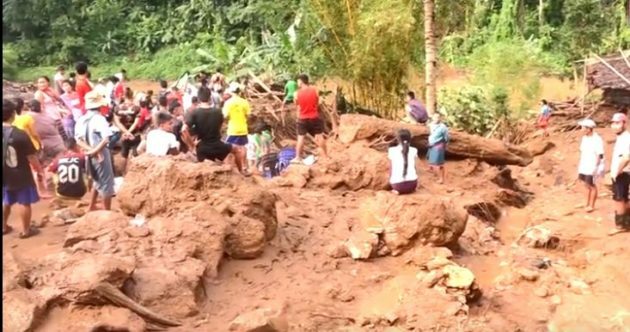 A flash flood and landslide ripped through the Mae La Oon Karen refugee camp on the northern Thai border early Sunday morning. The sudden flooding killed one refugee, injured 11 and left 7 missing. The Mae La Oon refugee camp is located in the mountains surrounding Mae Sariang district, Mae Hong Son Province northern Thailand. Camp officials told Karen News people are in shock and trying to locate the missing and salvage belongings from destroyed buildings. Saw Bway Doh, an official from the Karen Refugee Committee’s (KRC) Mae Sariang office explained to Karen News that the flash flooding and landslide took place at Section 1 of Mae La Oon refugee camp in the early hours on September 16, 2018. Saw Bway Doh said buildings washed away included offices of a non-governmental organization (NGO) working in the camp, a Church, and the camp meeting hall. The camp officials are battling to organize health care for the injured and relocate people whose houses were destroyed. Officials said NGOs and Thai rescues teams are now at the camp and have started searching for the missing people. The KRC and camp officials have organized emergency meetings to coordinate rescue and relief efforts. It is not the first time the 9,000 residents of Mae La Oon Camp have had to deal with flash floods but this years has resulted in a death and the worst level of damage.